It's the time of year when some students will be thinking of starting University or College. While it's an exciting time, there is a lot to think about. If you are leaving home for the first time, it can be even more daunting. To make it a little less nerve wracking, planning for the big move and the start of the next chapter can make all the difference. Budget! Never has there been a more important time to budget. While it can be tricky getting by on a student income, with careful planning it can be comfortably achieved. Have a think about your expenditure. How often does each expenditure happen? Is it weekly, monthly, bi-monthly, yearly? Your bank statements can help you here - take a look at the last three months and see where your money is going to. This means you won't be tempted to under-estimate or forget essential items you need to pay for. MindGenius can help you plan. Creating a detailed map should ensure you remember everything you need to. Add a branch called "Budget" and think around this topic. What will be your outgoings? 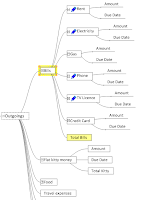 Add additional branches for things like the type of bills you can expect eg gas, electricity and phone. Think about the due date and try to work out a rough estimate of how much you might need to pay each bill. Add a branch for “flat kitty money.” If you are sharing with other people, this is one way to try and avoid arguments. List the type of things you might need such as essentials like bread, milk, loo roll, washing up liquid etc. Add another branch for “food”. It's hard to be exact but try and work out a weekly amount. Menu planning for the week can help you save money as you'll buy exactly what you need for each day. Maybe get a copy of a few of mum or dad’s favourite recipes. These could also be added to your map. Add a branch for “other expenses” and try to list where else you might need to spend money. Remember to include things like magazines and coffees from coffee shops as these all add up very quickly. Once you’ve had a think about your budget, it’s time to move onto more fun things, like what do you need to take with you to your accommodation? In terms of documents, personal items, clothing, decoration, kitchen, bedroom and any other items such as umbrellas, sewing kits and extra storage boxes. Or, what other type of things do you need to think about such as joining the doctor and dentist or signing up for student discounts through the NUS or Snapfax as well as any rail or bus passes you might need. You also need to start thinking about the kind of things you will need to help you with your studies such as your reading lists, an academic diary, text books, dictionary, thesaurus and exam result certificates. After you’ve done all the planning, it’s time to sit back, relax and enjoy your first term at University or College. Remember those days? Do you have any other tips you can pass onto students starting university or college for the first time about the type of things they should plan for? Even though the economic downturn in the UK appears to be slowing, there may still be challenging times ahead and most businesses will continue to look at ways they can reduce their outgoings. How can businesses save money? 1. Be green! Green measures like using email wherever appropriate rather than post, switching off lights and PC's when they are not in use and switching off heating overnight in empty buildings aren't going to bring massive cost savings but in these times, every little bit helps. Look at your utility bills for energy and water, raw materials and supplies and look for ways to make savings here too. 2. Market yourself in a more cost effective manner. Utilise e-marketing techniques for newsletters, email campaigns, customer discounts and referral schemes. This saves money on postage but also printing costs, envelopes and delivery of materials. Look at your costs for offline advertising. Can savings be made here? 3. What are you paying for products and services? Can you negotiate any discounts? Build relationships and suppliers may be happy to help, for example, use a regular printer and they may be willing to look at producing different quantities for a lower price, or adding you to an existing print run, which will reduce costs. 4. Look at new technology. Find out what technology options could save you money, MindGenius use VoIP for our telephone lines which means you can make calls over the internet instead of normal phone lines and is fairly straightforward to set up. 5. Eliminate unnecessary costs. One way to do this is to reduce business costs for unnecessary travel and accommodation. MindGenius, when used in conjunction with a service such as Webex or Net Viewer allows you to undertake online meetings with customers or colleagues in far-flung destinations without leaving your desk. While you do have to invest in the Net Viewer or Webex package, if you are a company that relies on international business, and undertakes several business trips a month, you should find the cost savings more than compensate for this initial investment. All of these measures could add up to save your organisation money. Can you afford not to try them? Or, have you utilised any other innovative ways to save your business money? As the PowerPoint application turns 25, many of us will have memories of sitting through Presentations that are delivered this way. However, according to Presentations expert, Max Atkinson, PowerPoint Presentations are often boring, and many of us will have experienced this for ourselves. But how do you avoid your audience’s eyes glazing over and ensure your presentation is informative and interesting? A big problem with presentations can be an initial misunderstanding of the brief. You need to spend time reading and understanding your brief. What type of presentation is required of you? Who is your audience? If someone else is organising the meeting, what are they expecting from you? Is it a formal presentation? Is it an informal chat? Is anyone else presenting? If so, what are they presenting on? Afterall, you don't want to repeat the same information. A key issue with presentations can be the fact that content can become secondary to the look of the presentation. It can be tempting when you are working within PowerPoint to play around with the background template or to add funky animation to your presentation but this can be at the expense of the message. Instead the look and feel of your presentation should come after you have fully planned the content of your presentation. Sometimes when you are putting together a presentation it can seem like a good idea to share every single pearl of wisdom you know on a topic. Instead you should first of all consider your audience and the level they are at, what may they already know about the topic, what will be over their heads? This should also ensure you you cover the type of information the audience will be expecting. Remember if you first of all plan and prepare your presentation in MindGenius, there is a one click export to MS PowerPoint, or you can present directly from MindGenius. Do you have any nightmare PowerPoint presentation memories? Have you used MindGenius to overcome any of these issues? If you are using MindGenius to plan a project, it can be helpful to add Resources to your map so you can gain an understanding of who needs to do what. You can import your contacts from MS Outlook. You can also deselect certain resources if you don't wish them to be imported to your map by unchecking the tick mark at the side. If you find you have imported Resources that aren’t required, such as personal rather than work contacts, go to Edit/My Resources and you can select individuals to remove or remove in bulk. 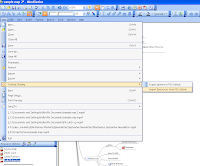 To assign a Resource, either highlight the branch you wish to assign a Resource to and double-click, and the initials of the resource will be added, or, if you need to add the same Resource to multiple branches, select the Properties Dropper and click on each branch that requires the addition of the Resource. The initials of the selected Resource will now appear on the selected branch. If you would like to see the workload of a Resource, select View/Create Resource Map and this will create a separate map that allows you to see at a glance who has been assigned tasks. 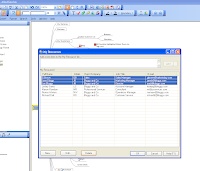 This is ideal for managing a small project, or if you are working on a large and complex project, you can click “export to Project” to create a fully formatted and editable MS Project plan. 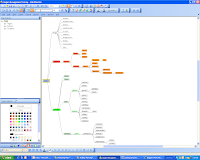 In the same way as MS Office packages, MindGenius allows you to use F2 to edit, Just hit the F2 key and the "edit branch" dialogue will appear and allow you to quickly format the text on your branch. We started Summer with promises of sunshine and an all out heatwave, but with the MET office changing their predictions and most of the country being lashed with rain, many people, myself included, are taking the opportunity to book a last minute deal to somewhere that is experiencing great weather, with ABTA reporting a surge in such bookings. While booking a last minute holiday should deliver on the sunshine stakes, preparing for it is stressful with 101 things to think about from what to take with you, to what to do when you arrive, and with less time to prepare tension can rise and tempers flare. One way to reduce stress levels, is to use MindGenius to plan for your holiday. Doing this not only saves time but should ensure you cover all eventualities. Preparing a basic holiday preparation map takes just minutes. Your level 1 branches should cover things like what to do, what to take, what to purchase etc and these can be easily built up using Type and Return. Then you can go on to outline the specifics of this. For example, under packing, you could outline the types of things you need to take, toiletries, accessories, clothes specific to certain times ie for day or for evening wear. This will ensure you only take what's required - no more squeezing your over-flowing suitcase closed! And under things to do, you could outline available excursions, restaurants you would like to visit, bars that sell nice cocktails. Then you could go onto to outline what the cost of these excursions is, average cost for a meal etc. This can help you to plan and to budget for your holiday, all the more important in these credit crunch days. Spending a few minutes preparing a map can help you to spend less time stressing before you get to your sun lounger and sangria! Everyone is worried about swine flu at the moment with the media full of conflicting stories about steps we should take to avoid it but with so much information available it can be difficult to understand what is correct. According to the Royal College of GPs, even doctors are receiving “poor and inconsistent communication, including lengthy documents that are unworkable." In situations like this, where there is an abundance of information on complex issues, it is important to find a way to disseminate knowledge in a more logical, accessible, and memorable way. One organisation who is using MindGenius to do precisely this is Medmaps.co.uk. This site is a growing venture aimed at medical students and doctors, which offers a free library of mindmaps on various topics from depression to deep vein thrombosis. The site is a work in progress and it’s expanding by the day. 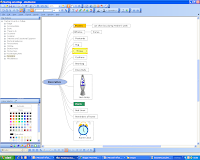 Take a moment to a look at this great website and its mindmaps for yourself! However, it's not just in medicine that this technique can be useful. This can also be done to disseminate large amounts of complex information out to teams and entire organisations no matter which industry you work in. Do you use MindGenius in this way? 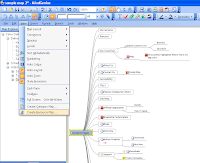 We all agree that Mind Maps are great for summarizing information, but what may not be so obvious is the benefits mind mapping can bring when we are working with large amounts of information or building understanding. I am just back from an offsite strategy meeting with our management team, and it’s incredible what we managed to cover in a day – all with one map, which will form the basis of action plans in the short term and ultimately be the baseline for review at the next meeting. To try and explain, once each quarter six of us spend the day reflecting on what we set out to achieve in the previous quarter, what has actually been achieved and address any shortfalls. From there we access the current situation and then look to plan for the future, always trying to ensure that we are aligning our activities, projects and actions to our short, medium and long term objectives. We discuss in details financial performance this year to date, revenue streams, channel partners and strategies, the user base, HR needs, succession planning, leadership programs, scalability across all operations, recruitment needs - even social activities to bond our teams together. We review our 5 year plan at high level, 3 year plans in a bit more detail, focusing on revenue streams that are emerging or diminishing, looking at product portfolio opportunities and put in place research plans to give us the intelligence to make the right decisions further down the road. We then spend a significant amount of time and energy planning out the 18 months in front of us. We look closely at the development roadmap and the internal projects required to help us achieve our objectives. We look at what needs done in research, development, marketing, sales, professional services, customer care, IT infrastructure and facilities to support what we aim to achieve and prioritize what projects to focus on in the coming 3 months, 6 months, 12 months, etc. We cover a lot. 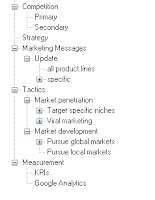 We capture the essence of what has been discussed as we go throughout the day using a MindGenius map. We also identify and assign what actions are required to progress each element to its next stage and agree those as we go along. It allows us to feed what we have discussed into our backlog of projects to do, or directly into our projects meeting if it needs to be addressed with a degree of urgency. In essence nothing is lost – every decision from that day is captured, worked upon and evaluated regularly and ultimately feeds back into the next strategy meeting where we assess whether the outcomes from the activities delivered what we set out to achieve. MindGenius allows us to summarise the information as we go, and jump backwards and forwards between disparate information. 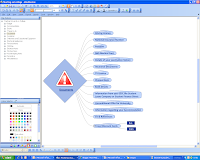 The MindGenius Map Explorer allows us to focus in on any section of the map and discuss it in more detail. At the end of the day, we can look at a “Level 1” view of the map which allows us to reflect upon the key points we have discussed that day. And at the end of the meeting no one has the onerous task of writing up disjointed and difficult to decipher notes as we have produced the working document throughout the course of the day. So by summarizing information as we go along and using the power of the MindGenius Map Explorer, we are able to focus on any specific topic in isolation and develop upon it, providing us with a single point of reference to make sure we are delivering what we set out to achieve and cross-checking that what we have done is delivering the results we desire. I think that alone would be impractical if not impossible without MindGenius. Has anyone else undertaken a strategy session with MindGenius? Is there anything else you would like to know about undertaking such a day with MindGenius? Those of you who regularly use MindGenius may be aware of the “outline” view that appears on the left hand side of the screen, below the file menu but many of you may be unaware of the capabilities of this feature. In-house at MindGenius, we couldn’t imagine using MindGenius without relying on it heavily. In short, Map Explorer allows you to focus in on any area in your map, either to revisit what you said earlier or to add more detail without getting lost in the detail. 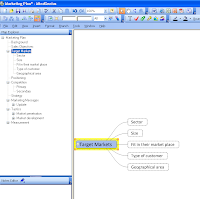 Many other mind mapping applications do not contain this facility and instead, you need to “pan” around your map. While this is fine on a small and simple map, if your map grows any larger than your screen size, it can be difficult to navigate. Just click on any word you wish to focus in on. In the main map pane, the view will change to display this word and any “child” branches you have associated with it. If you see a “plus” sign within map explorer, this means there are further branches and ideas hidden. Simply click on the plus sign to reveal them and then click on any you wish to focus in on. 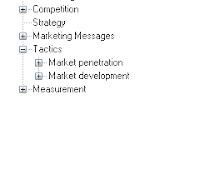 Likewise, where there is a “minus” sign, and you wish to view only key ideas in the outline, you can click this to hide the ideas and leave only the Level 1 ideas on display. This won’t change anything in the main map view unless you click on a branch name. This facility is also ideal if you wish to present directly from MindGenius rather than using the Export to PowerPoint capability. It allows you to display a succinct overview to your audience and then use Map Explorer to delve into each section of your presentation. 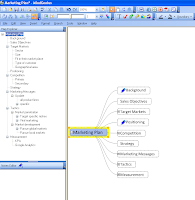 Mind Mapping has been used in education for many years now although doing it electronically is a fairly new phenomenon of the last few years. However, sometimes this use can be limited to the “expected” subjects such as English or Social subjects such as History. 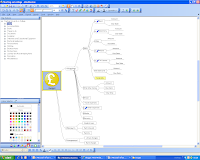 However, one man has been trying to spread the word on how MindGenius and mind mapping can be used by any department in a school for almost any subject. 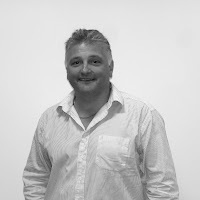 Former Deputy Head Teacher, and now educational consultant, Harry Hughes has been using MindGenius at St Andrew's High School in Coatbridge, Scotland. While he is still using it to great effect in English classes to create critical evaluations on texts and to facilitate class discussion in Geography classes, Harry has also used it across the curriculum in subjects from Science to Home Economics. Another interesting use was in a behaviour support class set up for students who were experiencing problems in that area. In this case, four S3 pupils were reflecting on what happens when they get angry and with the teacher's help were listing the feelings of anger they experience, grouping feelings and trying to categorise the kinds of things which make them feel angry and from that trying to draw up “coping” strategies to allow them to better manage their behaviour. S5 pupils also used MindGenius to plan out their personal statements for UCAS forms. “MindGenius is an ideal tool for use by teachers and learners at all stages in education. Are any teachers out there using MindGenius in an unexpected way? How are your students reacting? Or, would you consider using MindGenius in any of these different subject areas?